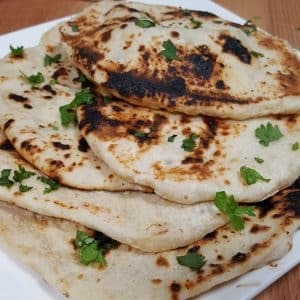 Authentic Homemade Indian Naan Flatbread is soft and delicious, super simple to make and is as good as any Indian restaurant. Indian food is one of my favorite things to eat and warm Naan, brushed with Homemade Pressure Slow Cooker Simple Ghee is so delicious. Dip it into Baingan Bharta or Saag Paneer, oh my gosh, it’s just heavenly. It is perfect to soak up all the delicious Indian sauces. 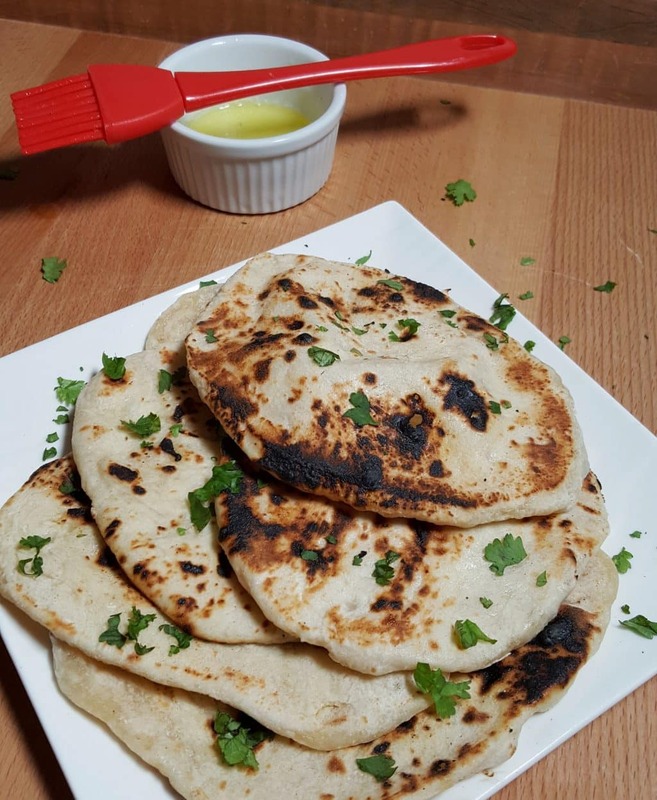 This simple Homemade Indian Naan Flatbread recipe is fun to make and tastes delicious. It’s always a good idea to know How to Properly Measure Flour. 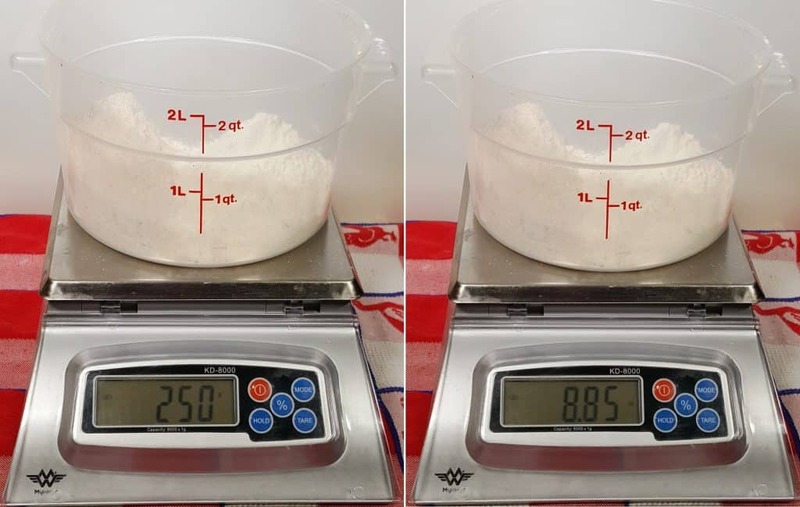 I like to use the Bakers Math Scale to weigh mine, but if you have Measuring Cups, please read the my article to see how to measure using Measuring Cups. How great to make Homemade Indian Naan Flatbread using your own Homemade Greek Yogurt!!! 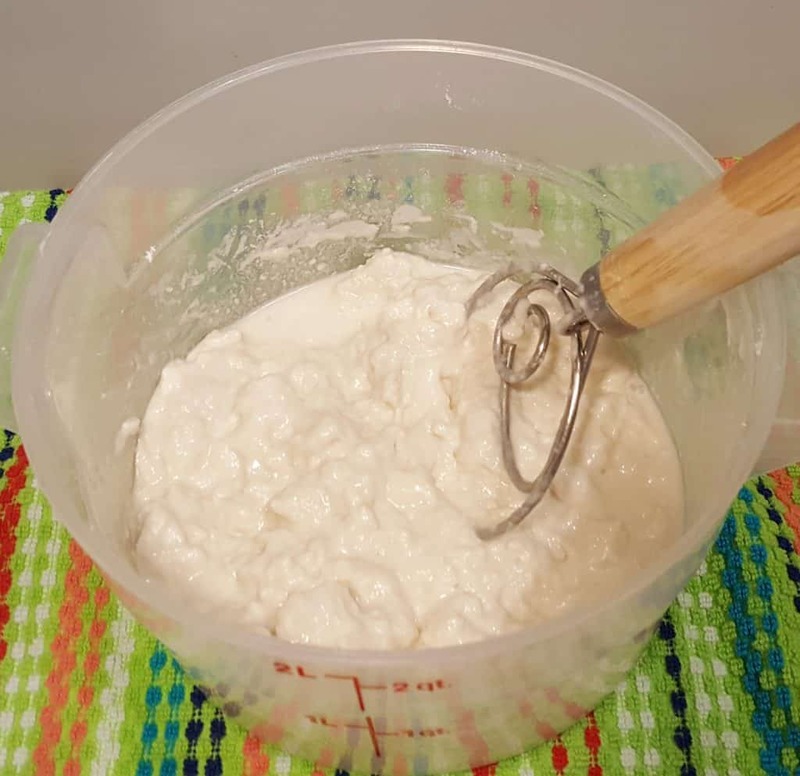 Use a Danish Dough Hook to mix up Dough and when the Dough starts to come together, use your hands to Knead the Dough until it becomes soft and slightly sticky. After mixing up the Dough, cover and allow it to Bench Rest in a warm place for 2-4 hours, so that it can double in size. Alternatively, you can use your Instant Pot and let it Proof, using the Yogurt/Less setting. Start with 3:30 hours. 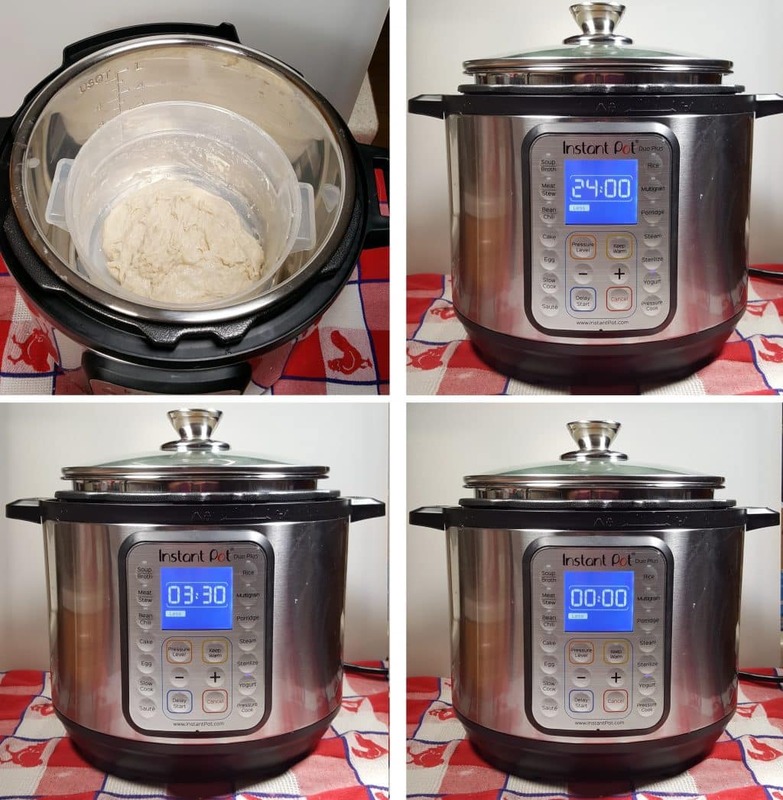 Please note: When using “Less” to proof bread, the time on the Instant Pot DUO Plus 60 COUNTS UP!!! Check to make sure the position of the Rectangular Lighted Display (“Less”) is to the LEFT. The “Normal” function, which is in the middle position, is for making Homemade Greek Yogurt. Place Dough on Pastry Board. With a Bench Knife, cut the Dough into Six pieces. With floured hands, roll the Dough into a ball and place on a floured surface. 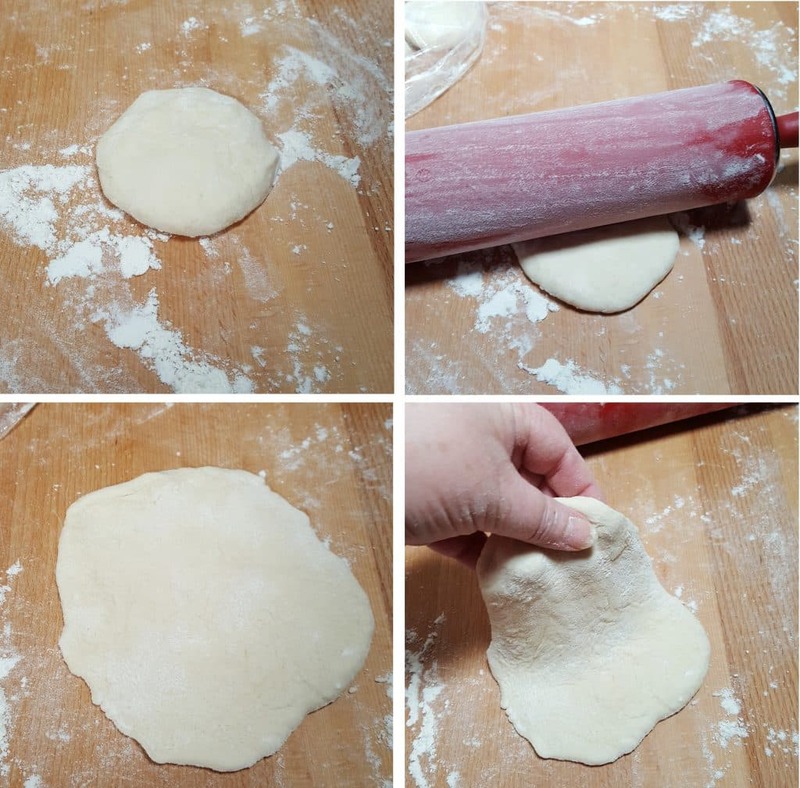 Use a Rolling Pin to roll out the Dough into a teardrop shape. Pick up the Dough and let the weight of it stretch it a bit. Dampen your hands and pick up one piece of Dough and flip it from hand to hand, so that the Dough is a little wet on both sides. Place the Dough into a screaming hot Cast Iron Skillet. It should start to bubble up in about a minute. Turn the Dough over in the skillet to cook the other side. You should see some black and blistered areas. Cover the Skillet and cook for another 30 seconds to a minute. Place the Naan on to a plate and brush with a little Ghee. Sprinkle with a pinch of Sea Salt. Cover with a Flour Sack Towel to keep warm, while cooking the rest of the Naan. Check out this preview to my new Yogurt Whey Chapati recipe! 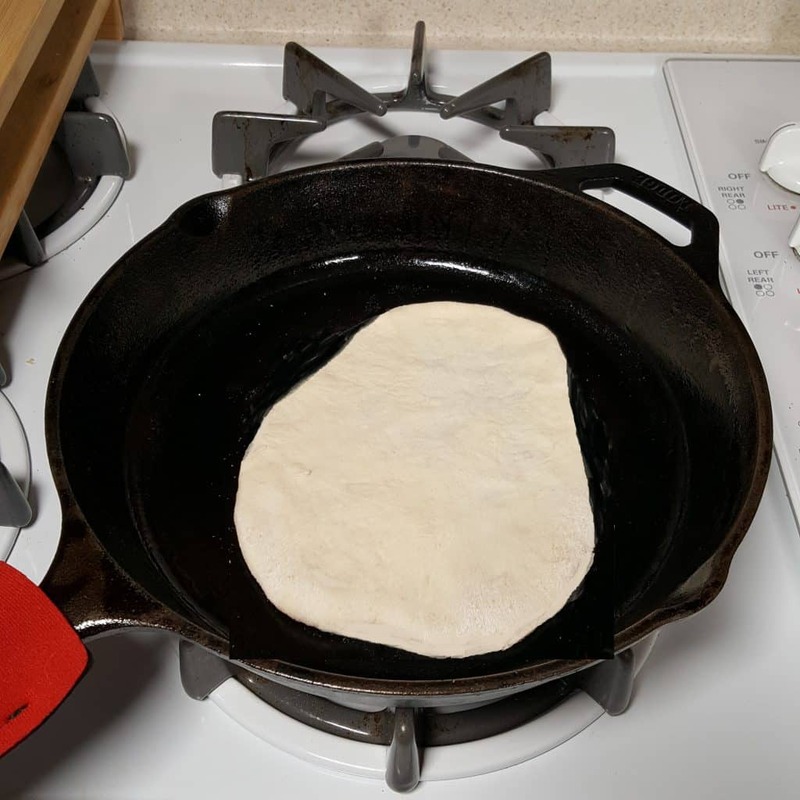 With very few ingredients and a Cast Iron Skillet, you can cook the best Naan you ever had. Serve your Homemade Indian Naan Flatbread, along side a plate of my Pressure Cooker Chicken Tikka Masala. In a large bowl, dissolve the dry yeast and 1 teaspoon sugar with 3/4 cup warm water (about 100 degrees F) and let it sit on your counter until frothy, about 10 minutes. In another bowl, sift the flour, salt, 1 teaspoon of sugar and baking powder. Add the yogurt and the olive oil to the frothy yeast mixture and stir to combine. Pour the yogurt mixture into the dry ingredients and gently mix the ingredients together with a Whisk or fork. When the dough is about to come together, use your hands to knead until the dough becomes soft and slightly sticky. 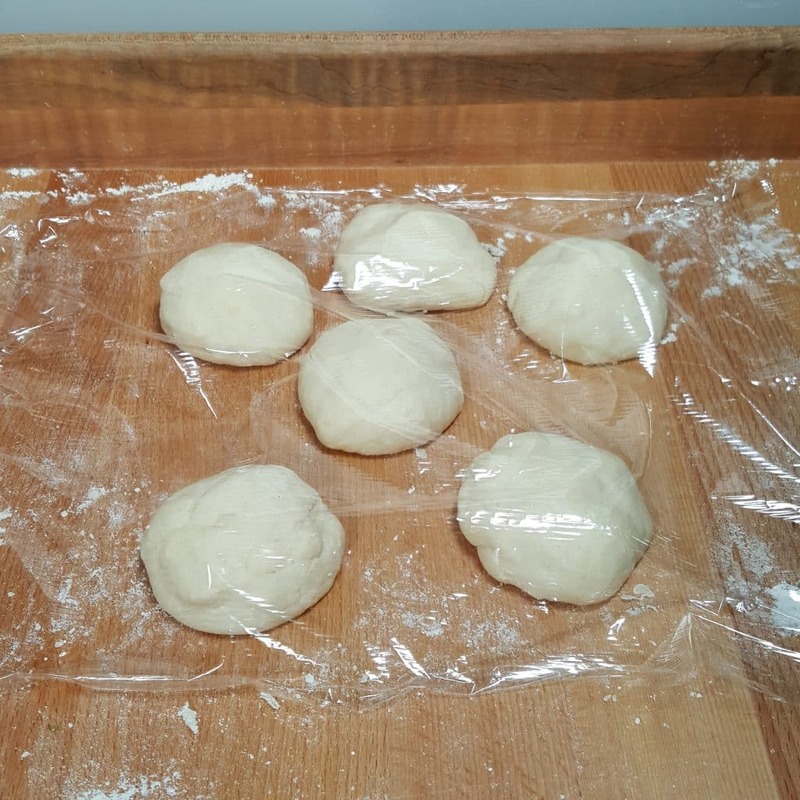 Cover the dough with plastic wrap or a damp tea towel and let it sit in a warm, place for 2 to 4 hours. Have two bowls next to your Bread Board; one with flour and one with water. The dough will be very soft and sticky. Separate the dough into 6 equal parts and with floured hands, lightly roll into a ball and place onto floured surface. Shape the Naan into a teardrop shape with a rolling pin. The Naan should be 1/4 inches thick, 8 inches long and 4 inches wide at the widest point. Once formed, pick up each piece by one end, so that the weight of the dough itself will stretch it a bit. Heat a Cast Iron Skillet over high heat until it just about smokes. Place a bowl of Ghee or melted butter on the counter. Dampen your hands in the bowl of water and pick up one Naan and make sure it is a bit dampened on each side. Gently lay it in the skillet and wait about a minute. The dough should start to bubble. After it bubbles, flip the Naan. It should be a little blistered and blackened in places. Cover the skillet with the lid and cook 30 seconds to 1 minute more. Remove the Naan from the skillet and brush with a little Ghee or melted butter and sprinkle with a little sea salt. Place each Naan on a plate, lined with a tea towel and cover. PIN this Authentic Homemade Indian Naan Flatbread! Jill, you might want to edit #6 so that people know to add the oil to the skillet before heating. People *should* know but not everyone will know. Thank you for this question, I wondered abou oil as it isn’t in the ingredients. I am assuming you don’t need a lot, is that correct? Did you really mean to set the IP to proof for 1-1/2 MINUTES? Looks like you were using a plastic container in the Instant Pot when you proofed your Naan dough? 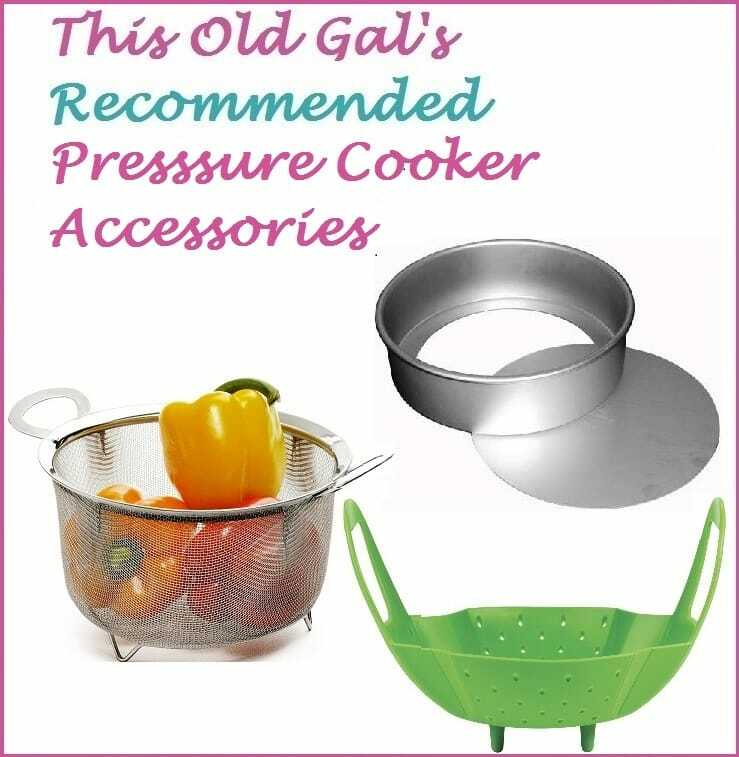 Have you not had any problems with the plastic getting too hot? I want to make these to use in AF for fast individual pizzas. Will they store well in fridge or must I freeze them?